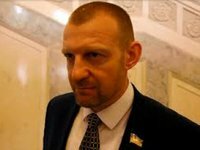 Andriy Teteruk, first deputy head of the People's Front faction in parliament, has said he hopes that the Verkhovna Rada will act quickly to pass draft law No. 9524 that bans citizens of the Russian Federation from being recruited as election observers for the presidential and parliamentary elections in Ukraine. "I am positive that within a short period of time it will be considered and we will get 226 votes. I can't see any obstacles for this draft law not to be supported," Teteruk told reporters in Kyiv on Tuesday. He said: "The essence of the law is very simple: it is not to allow citizens of the aggressor country and organizations that can represent the aggressor state to take part in the presidential and parliamentary elections as observers." Teteruk is one of the co-authors of the bill. As earlier reported, the draft law on amending some laws of Ukraine on the observation of the electoral process in Ukraine (No. 9524) was registered with the Verkhovna Rada on Monday, February 4.